Camouflage is used by an organism to prevent its detection or recognition by prey and/or predators. Thus, some species have evolved to send wrong or no relevant information to specific (or several) given receiver(s). By this way, these organisms increase their own fitness either by improving predation efficiency in case of aggressive mimicry or by increasing survival rate (defensive mimicry). Misumena vatia and Thomisus onustus are common sit-and-wait predators with a holartic distribution and exhibit strong preferences for flowers that attract large numbers of insects (Morse, 1981; Morse and Fritz, 1982). Both species have the ability to change their body colouration in a few days, depending on the colour of the flower (Weigel, 1941; Théry, 2007). It is widely assumed that this apparent flower matching is not only a form of aggressive mimicry against nectar- and pollen-feeding prey but also a form of defensive mimicry, especially against birds (Weigel, 1941; Chittka, 2001; Théry and Casas, 2002; Théry et al., 2005; Théry, 2007). 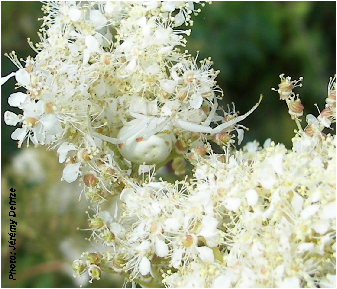 The aim of this project is to investigate camouflage in the colour changing crab spider Misumena vatia through a sensory approach. Using physiological and behavioural experiments combined with colour vision models, we are interested in studying camouflage efficiency, the visual mechanisms underlying the change of colour and the selection forces driving camouflage. 2006-2009. 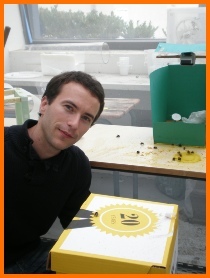 PhD Student, IRBI (France). 2005-2006. Master (2nd year) in Evolutionary Biology and Population Biology, University François Rabelais (France). 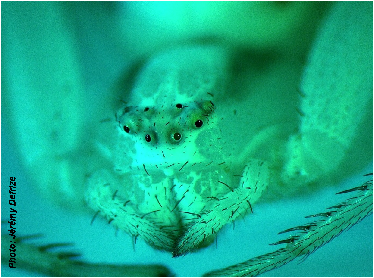 Mimicry; Ecology; Physiology; Crab spiders; Colour. Defrize, J., Théry, M. and Casas, J. 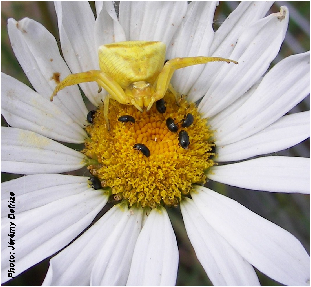 Background colour matching by a crab spider in the field: A community sensory ecology perspective. Journal of Experimental Biology. In press.